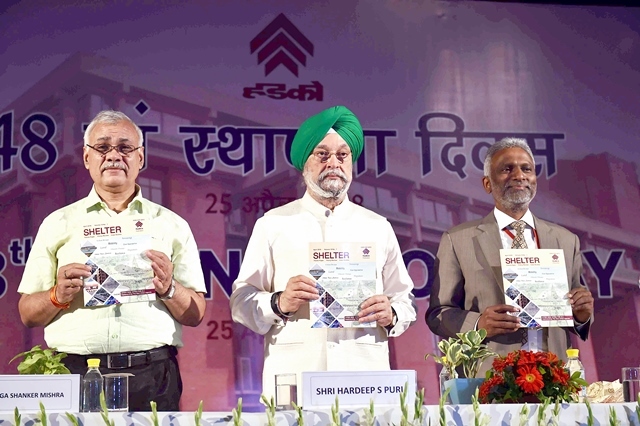 Shri Hardeep S Puri, Union Minister (Housing & Urban Affairs), inaugurated the 48th Foundation Day celebrations of HUDCO and addressed the august gathering. The Minister, congratulated HUDCO on completing 48 glorious years of service to the nation and highlighted the significant role of HUDCO in realizing the vision of “Housing for All”. He added that HUDCO must now look to adopt some of the identified aspirational districts under its CSR activites. He highlighted the importance of the need to encourage initiative, imagination, and institution building to develop a new India. On the occasion, the Minister released HUDCO publications namely, HUDCO Darpan, SHELTER, HUDCO Design Awards – 2017 and Sankalp. The Minister stressed that the felicitation is to inspire others in doing good work and gave away awards to the Best performing agencies, HUDCO Best Practices, Nari shakti awards, HUDCO Design Awards etc. Shri D.S. Mishra, Secretary, Ministry of Housing & Urban Affairs congratulated HUDCO on its outstanding performance in the last financial year and appreciated HUDCO’s support to the Ministry for all the action plan schemes of the Government of India. He stressed the need to encourage the spirit of innovation to guide HUDCO’s activities, so that HUDCO can aggressively leap forward in the growth of our nation. In view of HUDCO’s consistent performance over the past few years, he expressed confidence that HUDCO would soon attain the status of a navratna company. Dr. M Ravi Kanth, CMD, HUDCO highlighted HUDCO’s achievements in the last financial year wherein HUDCO attained highest ever sanctions of Rs. 38,627crores and highest ever disbursements of Rs.16562 crores in pursuit of its goals & objectives, with the social motto of Profitability with Social Justice. With these achievements, Hudco’s Balance Sheet has touched a record high of Rs.50,000 crore. He congratulated HUDCO for getting perfect score for the past two years, by getting 100 out of 100, under various parameters stipulated and targets given in MOU. During the year 2017-18, HUDCO reduced defaults of Rs.1,120 crore and has paid corporate tax of Rs.448 crore and dividend of Rs.108 crore and dividend tax of Rs. 25 crore to Government. Shri N.L. Manjoka, Director (Corporate Planning), HUDCO proposed Vote of Thanks. The celebrations concluded with a cultural programmes.